Some data sources are inherently hierarchical. These include SiteMapDataSource and XmlDataSource. 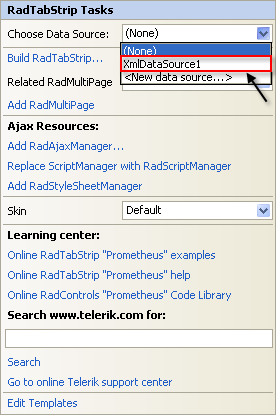 When data-bound to these types of data sources, RadTabStrip automatically creates the tab hierarchy. There is no need to use the DataFieldID and DataFieldParentID properties. When binding to SiteMapDataSource, there is no need to set any properties to map fields from the data source to properties of the tabs. This is because site maps have a strictly defined structure. The SiteMapDataSource control defines the structure of your Web site. You can have only one site map per site. 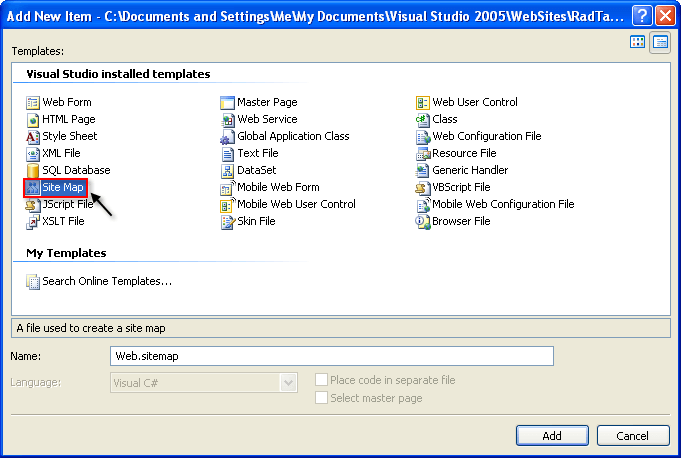 By default the SiteMapDataSource control uses the default Site Navigation Provider. This provider lets you define the structure of your site, separating the real page structure of the site on one hand, and the UI presentation on the other. The default site navigation provider is XML-based. It should stay in the root level of your project and should be named web.sitemap. Using the Site Navigation API provided in ASP.NET v2.0, you can write your own Site Navigation Provider and expose the navigation information from any back-end system, if needed. Before adding the SiteMapDataSource control to your page, you need to add the Site Navigation Provider. The url must be unique for each node. Avoid using backslashes () for your URLs. Backslashes may cause problems with some browsers. Instead, we use the slash character (/). Drag a SiteMapDataSource instance from the Toolbox to your Web page. Set the ShowStartingNode property of the SiteMapDataSource component to False. This allows you to use multiple tabs at the root level. 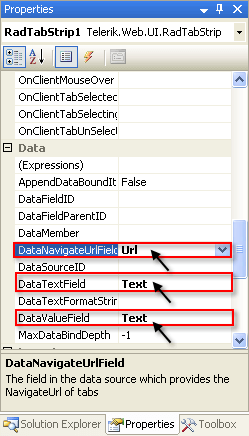 From the RadTabStrip property pane, set the DataSourceID to the ID of the SiteMapDataSource control. url - Maps to the NavigateUrl property.The path can be either relative (using the ~/), or absolute. title - Maps to the Text property. description - Maps to the ToolTip property. When binding to an XmlDataSource, RadTabStrip creates the tab hierarchy automatically. However, unlike SiteMapDataSource, properties such as Text and NavigateUrl are not automatically populated. 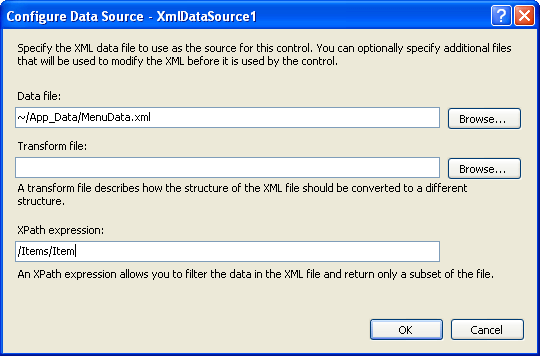 Set the Data file to the XML file you just added. Set the XPath expression to "/Items/Item". This removes the starting node of the XML file so that you can have multiple root-level tabs. This example has no separate field for value, so it uses the Text field for the Value property, for illustrative purposes.